When our district started purchasing interactive whiteboards a few years ago, I couldn’t wait to get one installed in my room. Once it was installed, I attended two half day training sessions on the software we would be using with the interactive whiteboards. I liked my new board but was overwhelmed with the software for a variety of reasons. Even after my two training sessions I still wasn’t comfortable using all the components. Also, I knew I could go on the internet and find ready-made activities to use with the software but this was time consuming and my searches often led to dead-ends or activities that were available for a fee. The ready-made materials I did download were great, but many were created to be used for single lessons. Last year I came across a blog that mentioned Gynzy. Willing to try something that might improve my interactive whiteboard experience, I hopped over to Gynzy to check it out. The first thing I noticed, was that it was internet-based which means that no matter where I create an activity, I can access it anywhere. No more emailing activities back and forth to myself, no more downloading software on every computer I might use, and no more flash drives. I won’t mention the numbers of times I created a lesson in the past only to have left my flash drive at home, making the lesson impossible to use. The next feature on Gynzy that peaked my interest were the assorted tools. 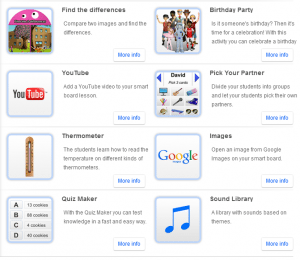 Gynzy has tools for reading, math, science, and social studies, plus extras such as timers, sounds, dice, and lined “paper”. I am now able to sign into my Gynzy account, open up a blank board or tool and move throughout my day. To help teachers even more, Gynzy has partnered with some top education friendly companies such as CNN Student News, YouTube, Google, BrainPop, and TeacherTube. When creating lessons you can select pictures from Gynzy’s massive image library, add pictures from Google, or even videos from TeacherTube without leaving the Gynzy site. Gynzy is constantly creating new templates, lessons, and tools. Some I discover through exploration, and others I learn about from their weekly newsletters. If there is a tool I need that Gynzy hasn’t yet created, all I need to do is email them my idea and within a few months, it is usually created. Which brings me to my favorite aspect of Gynzy. They actively seek feedback and incorporate suggestions. I have numerous emails to and from Gynzy stemming from feedback that I’ve left on their website. When I suggest a new tool or improvement for a current tool, Gynzy contacts me for more information so they can create or tweak the tool to meet the needs of teachers and students. This is what has made Gynzy my all-time favorite technology tool. This is Nicol’s first post on the Gynzy blog. In the upcoming months Nicol will share more digital experiences with you! Did you like Nicol’s first post? Leave a comment! Share your experiences as well! Would you like to share your experiences as well? 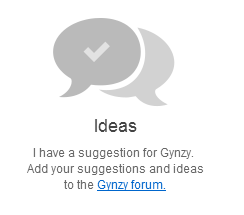 Send a message to Gynzy!